Inking on the Edge: BasicGrey Challenges # 45 and Magnolia Down Under Challenge # 98...Cherish! BasicGrey Challenges # 45 and Magnolia Down Under Challenge # 98...Cherish! Hey stampin' friends! I am back with another card today. I made this card for BasicGrey Challenges, which is, is Shabby Chic and at Magnolia Down Under Challenges, Kylie, has designed a gorgeous sketch for us to use! I will definitely be using this gorgeous sketch again, Kylie!!! Once again we have a fabulous prize at BasicGrey Challenges. 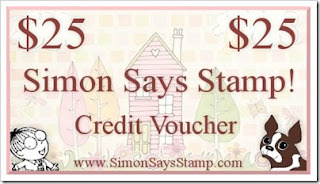 To be eligible for the generous $25.00 gift voucher to the Simon Says Stamp Superstore you need to make a Shabby Chic project and use at least one BasicGrey product on your card or creation and indicate in your post what BG item you have used. For the MDUC challenge we ask that you use a Magnolia stamp on your creation and we have a wonderful prize up for grabs this week too from our very own talented Denise, a set of her new gorgeous papers!!! Well, thanks so much for popping by again to see my BG Challenges and MDUC Challenges card! I really hope you can join both challenges! Please visit the DTs too and check out the gorgeous creations that they have made to inspire you! So beautiful card Tara,I love the image and the colours. WOw, this is lovely! I love all the white and touches of color. Tilda is colored beautifully! 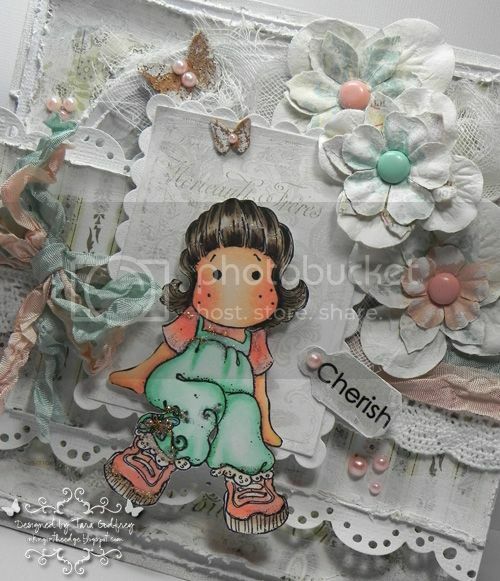 Wow, what a pretty card Tara and the colours and embellishments are simply gorgeous! The softness you've achieved in this is amazing & I love all the detail with the multiple textures of gauze, lace, doily edge & seam binding. the way you scatter pearls is delightful too & I love the colours of those brads. WOW your soft pastels look amazing! I love all the layers - such a beautiful card. OMG!! This card of yours is frikkin amazing! Love it :) I especially like all the white togheter with the green and peach. Lovely flowers and beautiful coloring! Also loving the ribbon - absolutely gorgoues! What a beautiful shabby chic card, Tara! Love the softness, pastels and your coloring of that sweet Tilda! WOW Tara, I'm speechless!!!! This is so beautiful - perfection!! Not only that I'm stunned to see a Tara card without the glorious array of colours but I love, love, love it! !